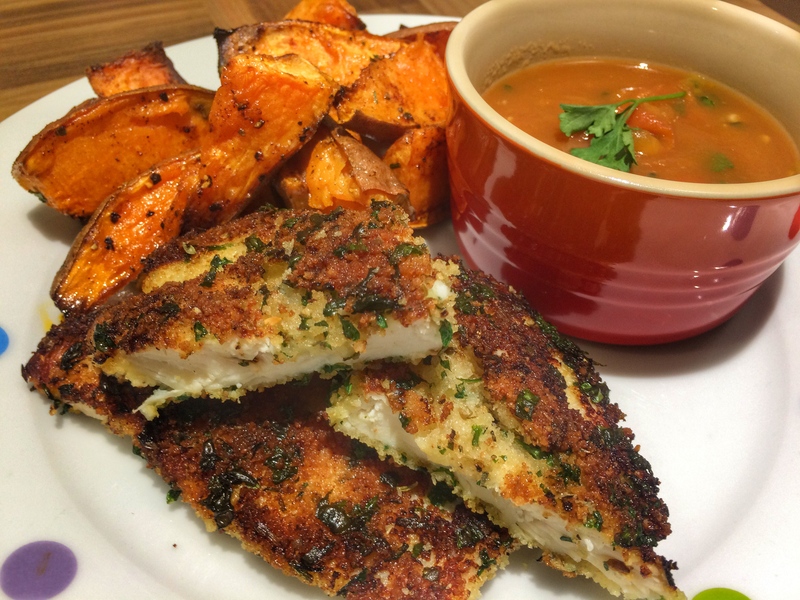 Breaded chicken and fish fingers reminds us of a bygone era of school dinners. Of course these items are still available to buy, but a recent visit to Coin Laundry in London, where we ate half a roast chicken Kiev for lunch, inspired us to make our own breaded, crispy chicken in the Season’s Eatings kitchen. This recipe for crispy breaded chicken with a tomato salsa is an ideal recipe to cook at the weekend and makes perfect use of ripe tomatoes, which come into season from June. The recipe makes enough to serve 4 people crispy chicken pieces with a fresh tomato salsa. We served this with some roasted sweet potato wedges, spiced with smoked paprika. Start by preparing the tomato salsa. 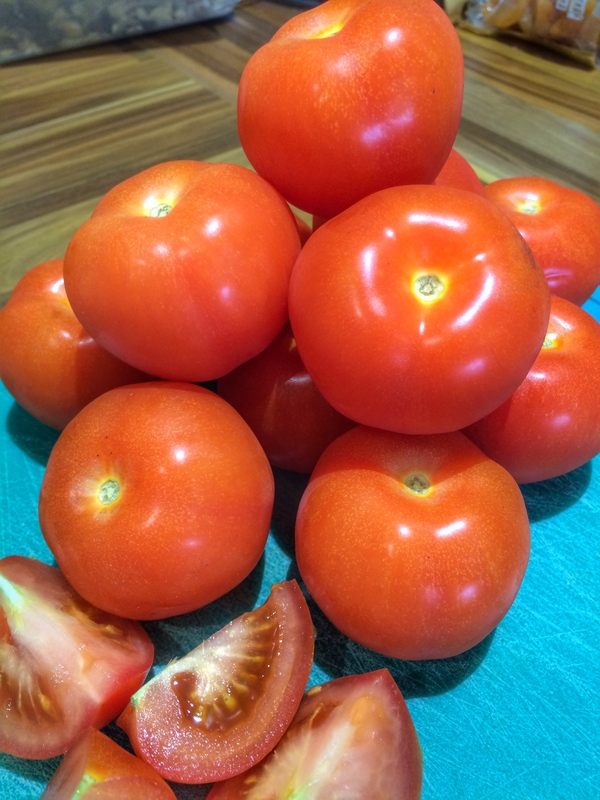 Cut each tomato into quarters or eighths (if bigger), put in a large saucepan with 2 cloves of garlic peel and crushed under the back of a knife. Add 1 tbsp of the fresh thyme, the basil oil and cook (with the lid on) for 10 – 15 minutes. While the tomatoes are cooking, prepare your stations to make the breaded chicken. Lie each breast flat and slice in half horizontally so that you’ve got much thinner pieces of meat to work with – this will ensure they cook quicker and also cook all the way through. Beat the egg in a shallow dish. Then chop half the parsley and mix with the breadcrumbs and a pinch of sea salt and freshly ground black pepper on a plate. Returning to the salsa, remove from the heat and use a stick blender to coarsely blend on a pulse setting. You may need to use a tea towel to cover the pan to stop tomato juice spluttering up at you. 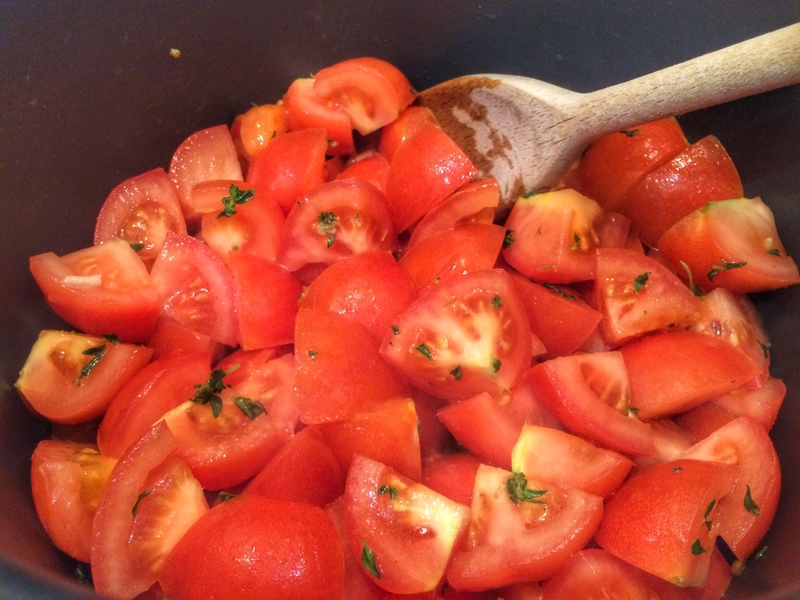 Chop the remaining half of the parsley and stir into the tomatoes with the balsamic vinegar. Leave on the stove until ready to serve up with the chicken – keeping a lid on should keep this war enough, alternative keep warm on a very low heat. Add the oil to a large frying pan over a medium heat. 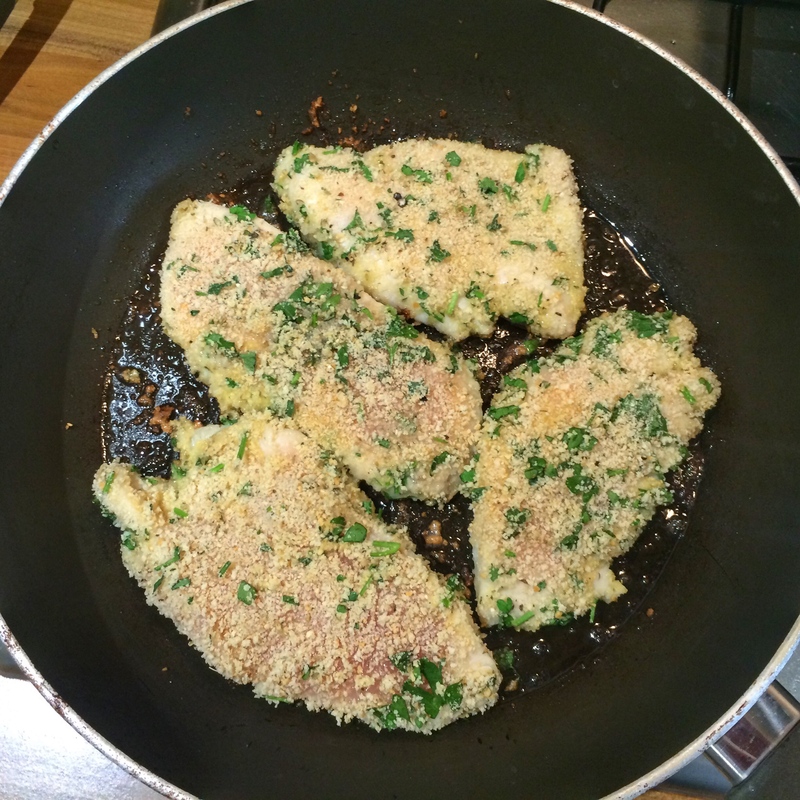 Dip each chicken breast in the beaten egg and then in the breadcrumb mixture, ensuring an even and full coating over. Shake any excess crumbs off and transfer to the frying pan. Cook each piece of chicken for 4-5 minutes each side, until crispy and golden and there is no pink meat left in the chicken. You may have to cook in 2 batches, like us – see below. Serve the 2 pieces of chicken per person with a portion of the tomato salsa and roasted sweet potatoes.